A protein called HER2, which is found on the surface of cells, is found in very high numbers on the surface of some breast cancer cells. Breast cancer in which the cancer cells have high levels of HER2 is called HER2-positive breast cancer. Up to about a quarter of breast cancers are HER2 positive. These cancers tend to grow more quickly and spread more aggressively than other breast cancers. However, therapies targeted at HER2 (often given in combination with chemotherapy) can be used to treat HER2-positive breast cancer (see a previous post). For a significant proportion of patients treated with HER2-targeted therapies, their cancer will eventually come back or get more advanced. This is often because the cancer cells have found a way to avoid the effects of the cancer drug and have become drug resistant. If we can work out exactly how the cancer cells become drug resistant, we may be able to develop treatments to overcome or prevent resistance. Our recent work at the University of Edinburgh, in collaboration with AstraZeneca, set out to examine the changes in breast cancer cells that become resistant to HER2-targeted drugs. To study this in the laboratory, we grew breast cancer cells in dishes. We exposed some of these cells to HER2-targeted drugs – either lapatinib (from GlaxoSmithKline) or sapatinib (from AstraZeneca) – and they eventually became resistant to the drugs. 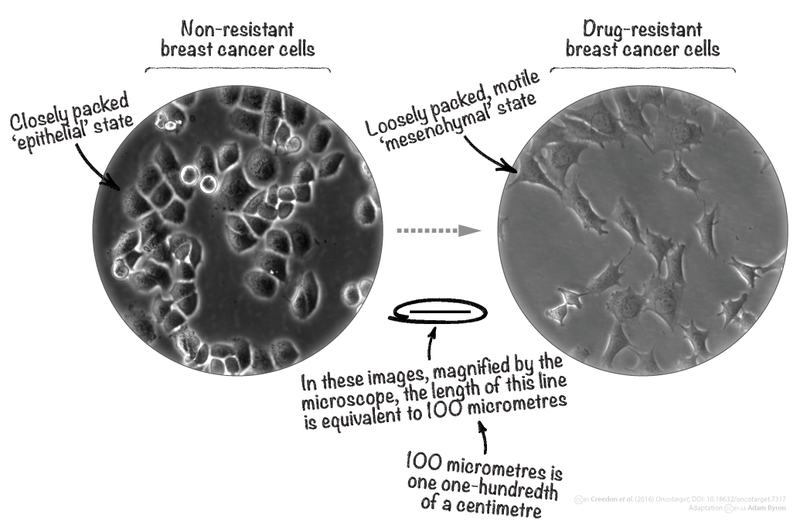 We used this laboratory-based system as a more convenient ‘model’ of what happens in breast cancer drug resistance. When we looked at the levels of proteins in breast cancer cells after they had become resistant to the drugs, we found changes in a specific set of proteins. This unique protein signature was linked to a transformation in the cells that turns them from a closely packed epithelial state to a motile, loosely associated mesenchymal state – a so-called epithelial-to-mesenchymal transition (or ‘EMT’ for short). Looking down the microscope at these cells in dishes, this is exactly the change we could see. From a sample of 289 people with HER2-positive breast cancer, we compared the levels of genes that encode the proteins in this EMT signature. High levels of genes encoding this signature were associated with poor outcome in patients with HER2-positive breast cancer. So, is it possible to counteract these detrimental protein changes in resistant cancer cells? We found that, by targeting two enzymes associated with EMT – called Src and Axl – with drugs (including a new, highly selective Src-targeted drug developed at the University of Edinburgh), we could stop the growth of resistant cancer cells. The growth of non-resistant cancer cells was not affected. So this may provide additional options for the treatment of HER2-targeted drug-resistant cancer associated with this EMT signature. Interestingly, both HER2-targeted drugs tested caused very similar protein changes upon resistance. This provides vital clues as to common ways that drugs may eventually stop working in cancer cells. These clues offer potential opportunities to find new biological markers (‘biomarkers’) that can be used to indicate or predict cancer drug resistance and so adjust therapies accordingly. The protein analyses reported in this work – the results of which are freely available – equip cancer biologists with a useful data resource. This can now be used as a springboard to study other cancer cell signalling events in HER2-targeted drug resistance. Overall, the data from this study add to a growing picture of what happens when cancer cells become resistant to targeted therapies. Understanding this could help in the design of new treatments – and combinations of treatments – to overcome drug resistance. The research is available in the free-access journal Oncotarget. This work was supported by Cancer Research UK, the Wellcome Trust, BBSRC and EPSRC.